YourWelcome Recommendations – What’s New? 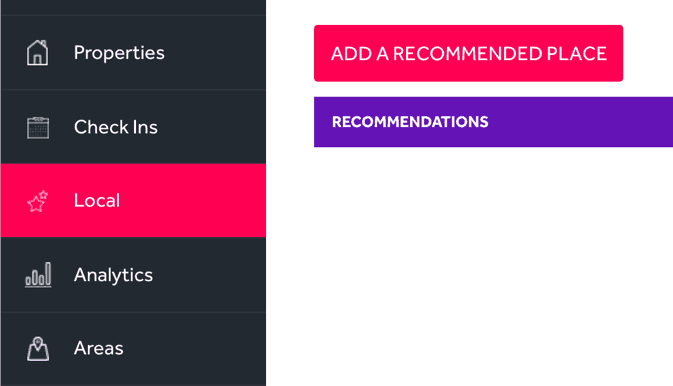 Adding recommendations has never been easier. Recent updates to the YourWelcome dashboard will allow you to share your favourite local places between all of your properties. Next time you want to add a recommendation, head to the new ‘Local’ tab in the dashboard – all of the recommendations that you add here are shared between all of your properties. Your tablets will automatically show the closest nearby recommendations, so you can continue to add all of your favourite restaurants, bars & places in one go. Want to add a specific recommendation to an individual property? No problem; simply navigate to the property in the dashboard, and go to the recommendations button from the property overview. The recommendations that you add will be unique to that property. On the homepage of the Dashboard you will see a new tab on the left-hand menu bar. Under the new ‘Local’ tab we’ve added a whole new section for you to better manage and see what recommendations you are adding and where. From this tab you will be able to starting adding recommended places to your entire property portfolio. Don’t have any recommendations yet? If you haven’t added any personal recommendations on the dashboard yet this is a great time to start! As hosts, you’ll have more persuasion over what guests look for in the local area. Who better to recommend a good coffee shop or restaurant than the host themselves? Head to the dashboard and start telling guests about your favourite sandwich bar or cosy coffee shop on the tablet.